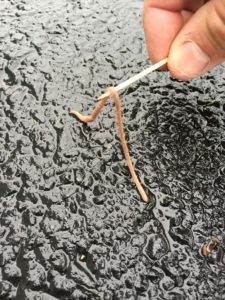 Spring showers bring us the bounty of “Driveway Worms”. 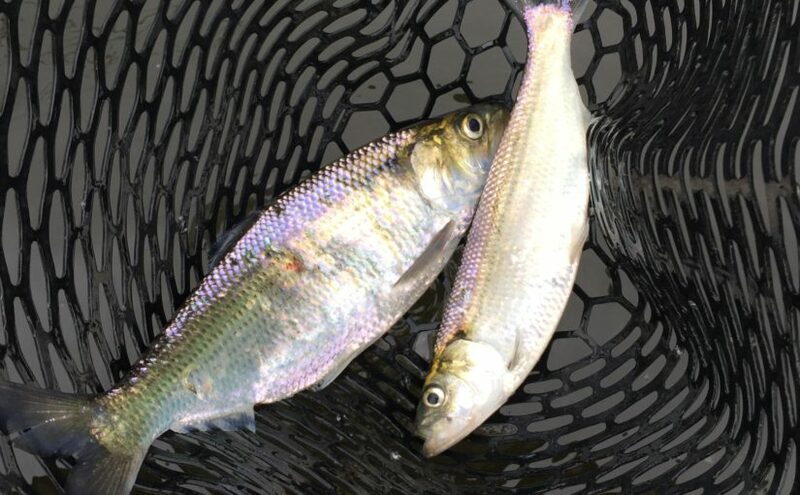 It is a convenient opportunity to collect free, natural baits. Sizes will vary widely. 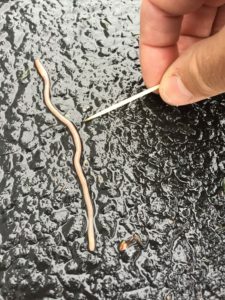 Small worms can be used as bait for catching bait, or ultralight applications. 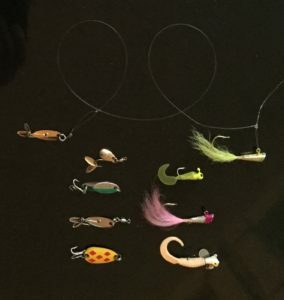 Full-sized nightcrawlers can be used for a number of different gamefish from walleye to catfish. What is the toothpick for? 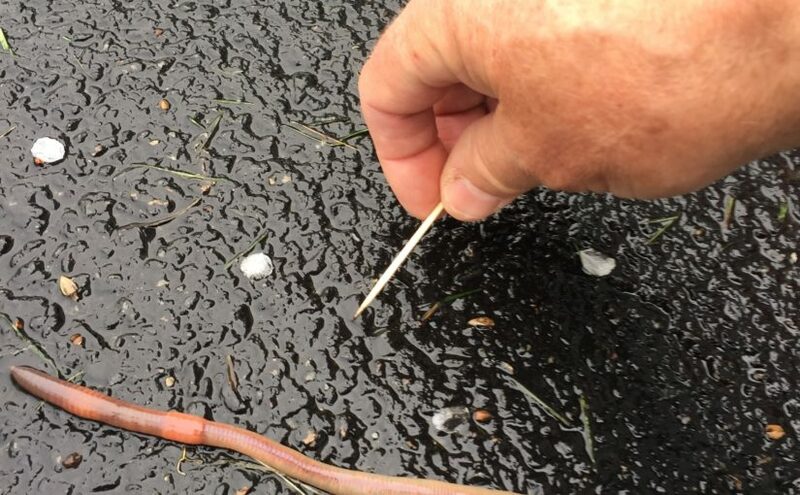 Slip the toothpick under the midpoint of the worm to lift them. It’s a lot easier than trying to pinch them off the pavement with your finger tips. 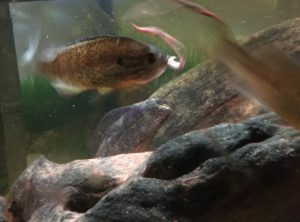 The smaller the worm; the more you will appreciate the toothpick method. You can cover the worms with loose soil or commercial worm bedding. Lately I’ve successfully used damp leaves. 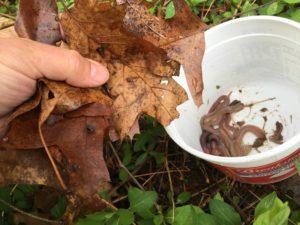 I have not found a lid to be necessary, When stored out of sunlight, directly on a cool garage floor, and covered with leaves; the worms stay put on the bottom of the container and last for weeks. Check on the leaves periodically. 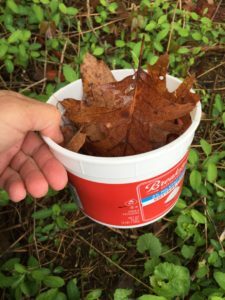 When they feel dry, replace them with a fresh covering damp leaves. Otherwise, your worms will turn into a wad of something between half cooked pasta and beef jerky. 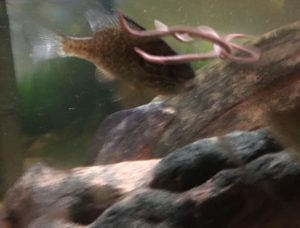 Small worms can also be used to feed residents of the home aquarium. 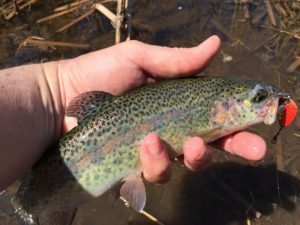 Like the first robins of spring, stocking trucks and the nets full of trout are harbingers of greener pastures. That is true both literally and figuratively. How ’bout that? 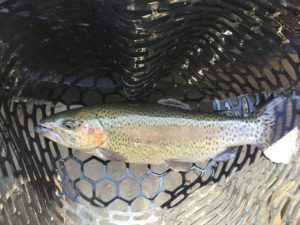 A colorful male “broodstock” rainbow trout. 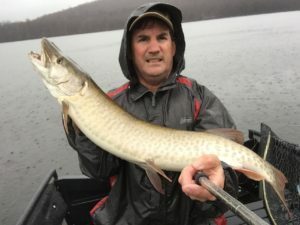 Wordplay aside, grab your Len Thompsons , or whatever your “go to” trout lures may be, and take advantage of these hatchery enhanced fisheries. 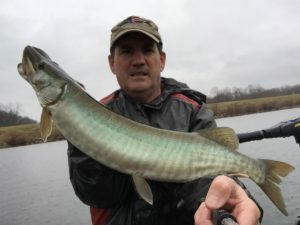 What run of the mill stockers may lack in size, they make up for in fight and eagerness to bite. 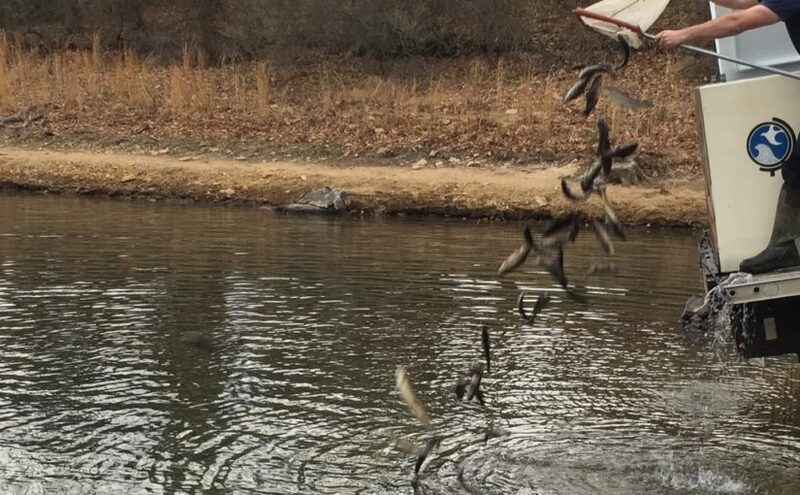 In my early years, April meant trout season. 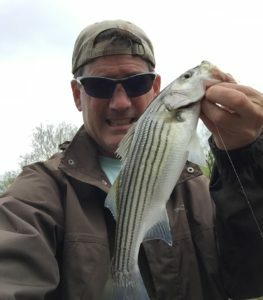 Then for many years I wouldn’t be caught dead near trout water in April. 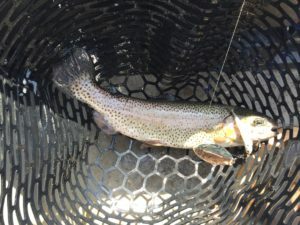 In fact, I looked forward to April as a decoy to draw people away from the non-trout waters. Recently, I’ve come full circle. 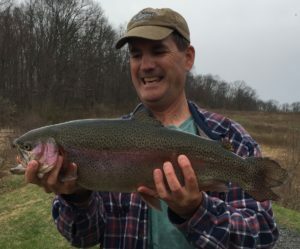 I look forward to fishing stocked trout waters like it’s some kind of manmade spawning run. 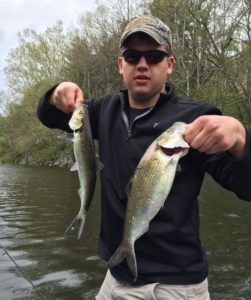 The action is fast, the size can be great, and for those inclined, it offers some guilt free harvest opportunities. 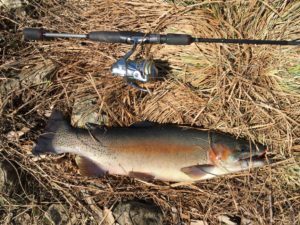 …two hands plus, stocked trout add a surge of variety and excitement to spring fishing. 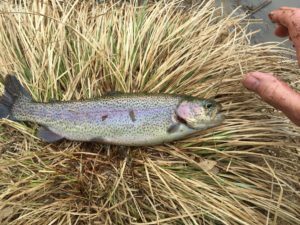 Stockers, stockies, planters, hatchery trout; call them what you will, they provide great spring action for those that partake. 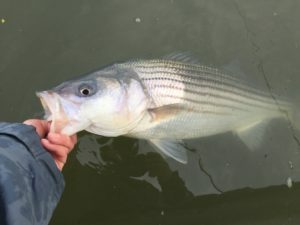 The bridge from winter to spring offers some unique and productive opportunities for fish of many species.